The concentration of creative activity in downtown Eugene will soon get deeper with the arrival of dozens of faculty members from the School of Art + Design, part of the UO’s College of Design, in the former Willamette Stationers building. 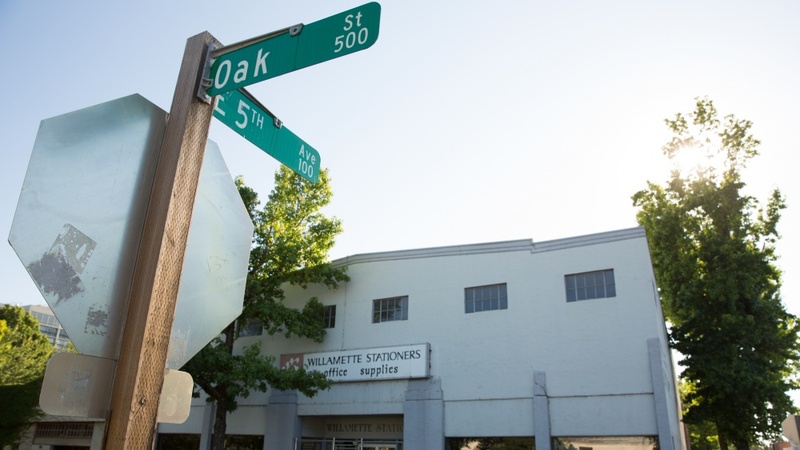 The University of Oregon recently purchased the building at 510 Oak St. and will convert it into studios. Faculty will move into the renovated space in September 2018. The siting of the new studios right in the middle of downtown Eugene occurred through a combination of foresight and serendipity. Over the past several years, the College of Design has explored moving some of its activities into the downtown area. One of the first of these moves was the Department of Product Design, which moved into the newly opened Innovation Hub at 942 Olive St. last year. About a year ago, the need for a new home for art and design studios became clear as a result of the development of the Phil and Penny Knight Campus for Accelerating Scientific Impact on the north side of Franklin Boulevard and the expiration of leases at another site. With some School of Art + Design faculty members needing to be relocated, the College of Design worked closely with Office of Academic Affairs and the Department of Finance and Administration leadership to find a permanent solution that would enable faculty to further their individual and communal objectives. It is the first major change to be announced since UO’s School of Architecture and Allied Arts was renamed the College of Design on July 1. The School of Art + Design is one of three schools within the college and it offers degrees in an array of fine arts, including digital media, ceramics, fibers, jewelry and metalsmithing, photography, painting, printmaking,and sculpture as well as product design. Laura Vandenburgh, head of the School of Art + Design and associate professor of art, said faculty are thrilled about the new development. Purchased for $1.84 million, the university and the college will ultimately invest a total of $5 million in the facility to create 24 studios, a gallery and a workshop in the roughly 14,000-square-foot structure near the heart of downtown Eugene. “We are excited that this building will create opportunities for collaboration and community engagement around creative practice and research, while aligning with our desire to be active and visible in downtown Eugene,” Lindner added. The studios at 510 Oak St. will soon be joined by a second major new arts facility at the UO. In October, the university will open the newly constructed Berwick Hall, which will become home to the Oregon Bach Festival. The $9 million, 10,000-square-foot Berwick Hall, located near the MarAbel B. Frohnmayer Music Building on the UO campus, will serve the Oregon Bach Festival’s expanding programs and create more opportunities for collaboration with the UO School of Music and Dance. The Berwick family’s generosity also funded the birth of the namesake Berwick Academy, which is one of America’s few residencies for top-flight young professionals specializing in historically informed performance practice.